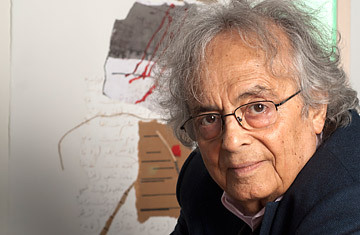 Ladbrokes says the Syrian - Lebanese poet and writer Adonis, Ali Ahmed Said Esber, is the lead runner for the Nobel Literature prize. In the U.S., the word "bookie" might conjure up images of shady men dealing out of backrooms at horse tracks. But in the U.K., bookies are busy taking bets on a most highbrow competition: the Nobel Prize in Literature. Gambling has long been a massive industry in Britain, but the rise of the Internet made betting easier than ever before; people go online to wager on everything from soccer matches to politics to who will win X Factor. According to a report from the Gambling Commission  an independent body sponsored by the U.K.'s Department for Culture, Media and Sport  the gambling industry brought in £5.7 billion ($8.8 billion) from April 2009 to March 2010 alone. Leading up to the October 6th announcement of the Nobel Prize in literature, London-based company Ladbrokes will be offering updated rankings of prospective winners' chances. People can go online to see the latest odds (as of this writing, Philip Roth and Haruki Murakami are 16/1 and 8/1, respectively) and place a bet accordingly. Take those odds with a grain of salt, however: Bob Dylan currently has the astounding odds of 5/1. To get an idea of what goes into literary gambling, TIME spoke with Alex Donohue of Ladbrokes. Ladbrokes currently has Bob Dylan ranked with the best odds at 5/1. How do you calculate a writer's odds? At the very start, when we put our list together, we have people for the shortlist and we have an in-house expert who uses lots of things on the internet  forums and social media  and who is quite a big literature fanatic himself, and he puts the list together. Then he puts the odds together based firstly on who he thinks has a chance and secondly on who represents the current thinking of the panel and wider world. And obviously, as soon as people start betting, that's also when things will change. So we introduced Bob Dylan at 100/1. We put him in because we thought that maybe he'd have a chance and a few dedicated Bob Dylan fans might want to bet, but [we assumed ]that no one would take him seriously. But now, obviously there's been a massive gamble and we've taken bets from all over the world  Sweden, Japan, Canada, all of Europe  on Bob Dylan. People out there betting just can't get enough and they keep backing him. So you have a lot of people outside of Britain betting? Oh, definitely. To be honest with you, in terms of the international appeal of the award, it's probably one of the biggest betting markets for us to attract customers from all over the world. Virtually every country that we can legally take bets from [which excludes the U.S.] has people betting on this. If you look at the shortlist, it's like the who's-who of international literary figures, so it attracts a lot of people. We try to keep betting open as long as we can until the announcement. At this stage we're going to keep it open all day [Wednesday] and into [Thursday] morning. We'll close maybe half an hour to an hour before the announcement [at 1:00 p.m. CET]. How many years has Ladbrokes been taking bets on literary prizes? We've been taking bets on not just the Nobel literary prize but also awards like the Man Booker Prize for about the last seven or eight years now. It's really growing. The amount of money we've taken on the literature prize has increased 400 percent since we first started taking bets. It started off as people just betting a couple of quid [pounds] and people weren't really interested, but now it's a real phenomenon. People are really interested in having a bet on this  people who might not be really interested in sports but still want to get the thrill of placing a bet. I read that last year was the biggest for Ladbrokes in terms of Nobel literature betting. How is this year stacking up? Yes, last year was the highest year and we've already virtually doubled that number [this year]. We're really happy with the way things have gone. But at this stage, if Bob Dylan wins, I think we might lose [some money] but that's just the game we're in, isn't it? So how much do Dylan gamblers stand to win if he scores the prize? Overall, Bob Dylan tracks about 30 to 40 percent of the bets so I think if Bob Dylan wins  and it's hard to say at this stage, because all the bets are rolling in now  but we reckon that if Bob Dylan wins we'll be paying out a good five-figure sum. What were the odds for last year's winner, Mario Vargas Llosa? Last year's winner was 40/1 and that was on the morning of the prize as well, so it shows how much of a shock result it actually was. Well, a shocking result in betting terms anyway. Who would you put your money on this year? Me? Well, to tell you the truth I'm allowed to bet, but I'm not allowed to bet with my own company. But if I was going to have a bet, I've heard from the beginning that the [Syrian] poet Adonis would have been worth a couple of quid. Obviously he was the favorite to begin with and there are a lot of quite shrewd people in the literary world who seem to think a poet might seem to be the winner for this year. If I was having a bet with another firm, then my [money] would be on Adonis.